A trend that I’m digging this fall is the grid/windowpane print I’m seeing on everything from sweaters to skirts to coats! It’s a fun print without being too wild, and turn out to be a classic look that you’ll wear year after year. Here are a few ways for you to get the look at any age! 20’s and 30’s are my faves. Love this! I’m really into this print for fall. I love these posts! It is such a great reminder that you can be fashionable at any time, but I must say, I still do love the 20s best! :) That skirt, bag and sandals are on my wishlist for sure! Okay, so I like everything about the 20′ and 50’s but I’m neither. Great post! 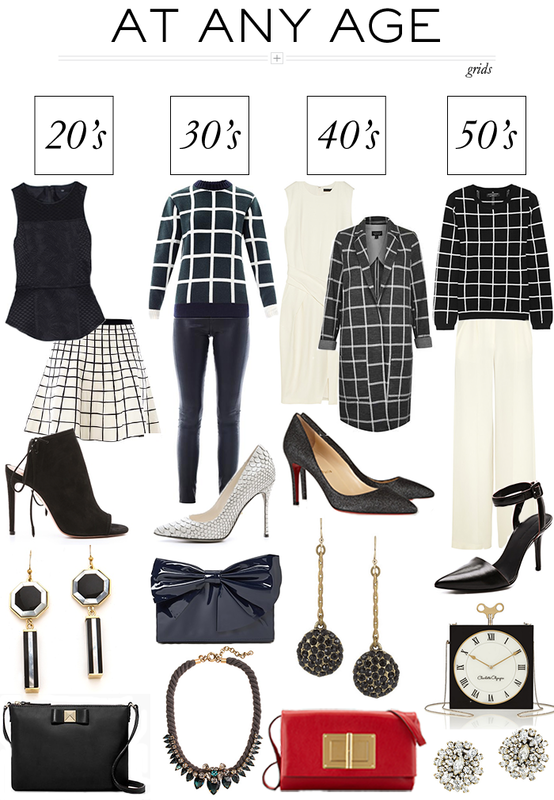 love these picks… black and white is a staple in my closet. how pretty is that jcrew necklace? i love it! Love that you included styles for those of us in our 50s! Love these posts and LOVE all these options! Great for everyone.